Forest & Bird’s Central Otago-Lakes Branch recently visited the Kakī Recovery Centre in Twizel. There, they discovered how this critically endangered bird is being managed – as Rachel Hufton reports. Kakī (also known as the black stilt) are the rarest wading birds in the world, yet few know they exist. We wanted to raise awareness about these critically endangered birds and the braided river habitats they rely on, by organising a trip to visit the Kakī Recovery Programme’s breeding facility in Twizel. Braided river habitats are home to a plethora of wildlife including a number of vulnerable and at risk bird species such as wrybill, black-fronted tern and black-billed gull. 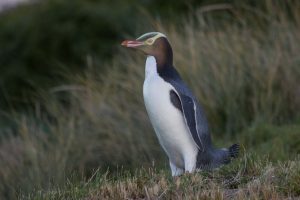 We were lucky to see all of these species when we started our trip at the Tasman River. We looked for the young Kakī that were released in August, and were treated to a visit from a pair of adults as well as wrybill, banded dotterel and black fronted tern. 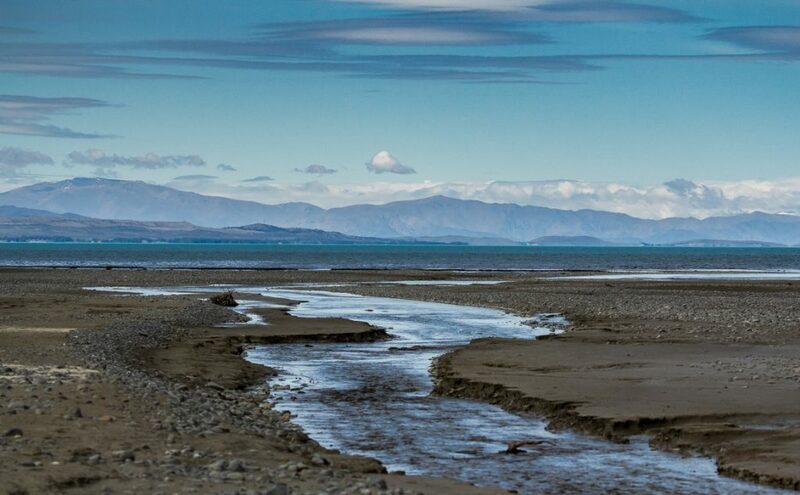 Looking for Kakī and other braided river birds on the Tasman River (Photo by Rachel Hufton). After lunch, we visited the captive breeding centre to meet the Kakī chicks. They ranged in age – some had only just hatched that morning, while the eldest chicks were three weeks old. The staff, Cody Thyne and Liz Brown, were very informative throughout the day. Kakī are one of New Zealand’s rarest birds and the mission of the Kakī Recovery Programme is to increase their population in the wild and ensure this special bird is not lost for future generations. Once, Kakī were common throughout New Zealand, but they are now only found in the Mackenzie Basin (apart from occasional exceptions). 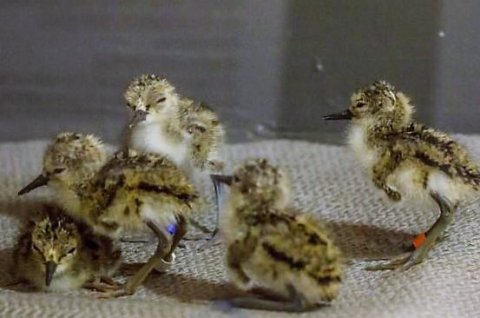 The facility at Twizel is where Kakī eggs are artificially incubated and the young chicks are raised in captivity before being released into the wild. At 3–9 months, they are released into the wild. Rearing them in captivity significantly increases their chances of survival by preventing predation when they are most vulnerable and it also gets them through their first winter, which can be tough for young birds in the wild. Kakī have been intensively managed since 1981, when their population declined to a low of just 23 birds. The Kakī Recovery Programme has now successfully increased the population of wild birds to 93 adults but this still needs to increase to sustain the population. The Recovery Centre is doing an important job for this vulnerable species but the facility is currently at capacity with more chicks than their brooding rooms can cope with. 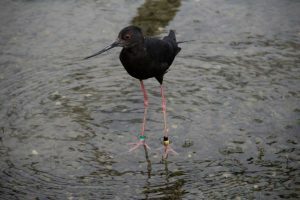 The facility needs to expand so the number of successfully reared Kakī chicks can be maximised to help secure the breeding success of this vulnerable New Zealand bird. Without this important facility, the Kakī population would be extinct within 7 years. So spare a thought for the Kakī and the wonderful people doing all they can to bring it back from the brink of extinction. Is DOC New Zealand’s biggest charity case? Growing up in the Sth island the sound of these birds brings memories of trout fishing on the open braided rivers and how lucky i was to have experienced the freedom as a child through teenage years. I also consider myself lucky to have experienced the crystal clear even drinkable water straight from the rivers. I must have walked nearly every mid Sth island river many times often with shotgun and dog following close by. It now makes me sick to the stomach to think that most of those rivers are permanently running as brown filth and even more so that the vast majority of our native species are being killed off not by predators but by the organisations that are supposed to protect them with their insane use of deadly, unsafe and cruel poisons. Any organisation condoning these actions need to pull their heads in. All our wildlife depends on it.